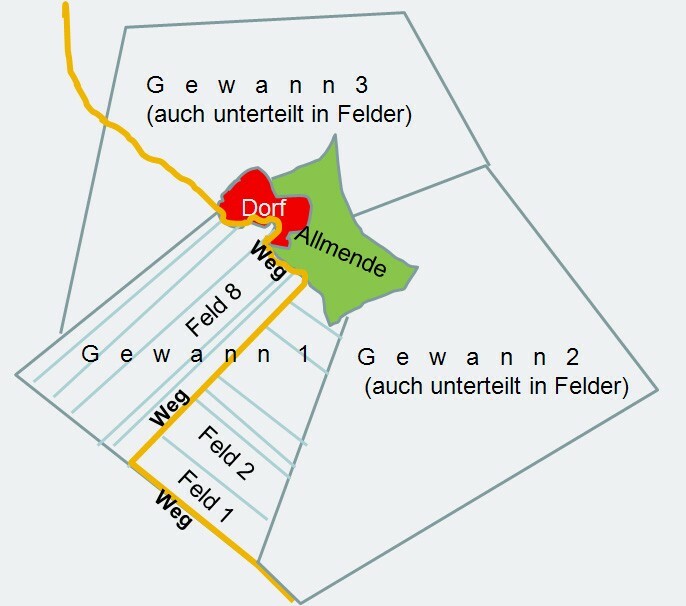 Designation (also Gewann Hall, southern German garment) for the Middle Ages resulting division of the field corridor of a municipality into mostly three sections, the so-called Gewanne. The tripartite division resulted from the then cultivated Dreifelderwirtschaft. Depending on the number of farms, these were subdivided into strips or parcels of equal size, which were cultivated in the so-called "Flurzwang" (forced regulation by the municipality, the whole of the owners or the respective landowner). This means that the work had to be carried out simultaneously on all fields of a wagon. The advantage of these elongated parcels was that only a few (elaborate) turns were necessary. As a typical property of a Wannen the length is at least ten times the width. As a result of division of the estate, an extreme dismemberment often occurred over time. The often imaginative names allow conclusions about the situation regarding climatic or soil conditions or even former agricultural use. These are, for example, Am Galgenberg, On the ley (Hint of slate), beautiful view and in the wet hole. This page was last modified at 1 April 2019 at 10:47.